If you’re looking for a quiet spot away from the crowded slopes of France, La Thuile could be for you. The ski resort is laid back, affordable and utterly pleasant. An excellent starting place for beginners and popular with Brits on a budget, La Thuile oozes the charm and sentiment you’d expect from a small Italian mountain village. Here you’ll find everything you need to know about La Thuile ski resort and a handy guide to local airport transfers. Sitting among the Valle d’Aosta, La Thuile was once a respected mining village that has now been expanded and restored. Today, sections of the area resemble that of a French purpose built resort. Don’t let that fool you though, the historic village is both quaint and picturesque. The combination of old and new combine perfectly together to offer a genuine but comfortable winter getaway. La Thuile is known locally as ‘Little Siberia’ and claims to have the best snow conditions in the Alps. 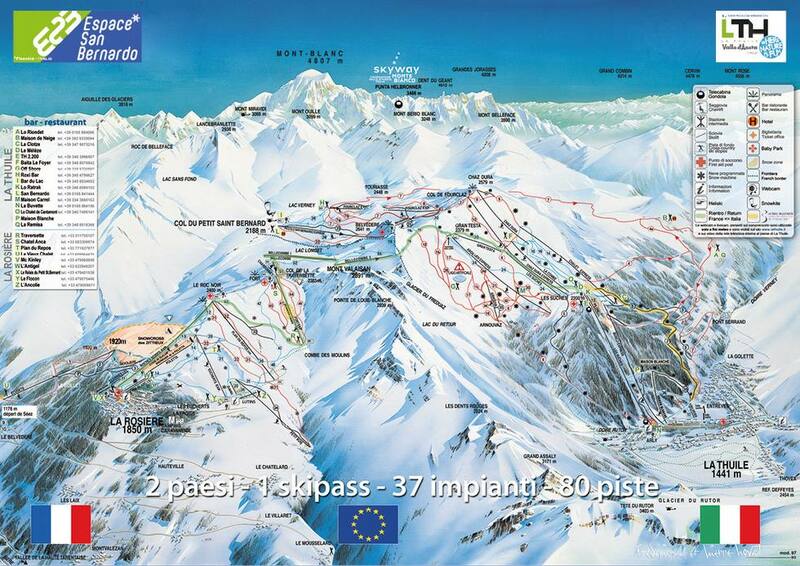 You can easily ski over into France to La Rosiere on one ski pass. The village, along with its French neighbour, is part of the international ski resort Espace San Bernado. This offers access to the breath-taking Rutor and Miravidi glaciers. When pricing our transfers, we take a dynamic approach. We don’t just offer a flat rate for the transfer to and from La Thuile. Instead, we take into consideration the individual circumstances of your journey. We’re already cheaper than our competitors but this dynamic approach lets us offer the very best deal. All of the above will only ever result in our base-rate for ski transfers going down – we never over-inflate our prices at any time or for any reason. We also offer substantial discounts for off-peak, off-season and midweek transfers to La Thuile. If looking for the best possible deals, travelling outside peak season or midweek typically results in the biggest savings. We offer midweek (Monday to Friday) prices with up to 60% discount than weekend prices. La Thuile is a resort that can accommodate all levels of skier. It has excellent runs for intermediate skiers and is a great place for beginners too. La Thuile is a great destination for families. The quieter slopes present the perfect opportunity for children to become comfortable with skiing. The nursery slopes are exceptionally helpful for first timers too. There are plenty of facilities specially designed for children while it also offers the allure of being moments away from an international border. We offer the lowest cost airport transfers to La Thuile ski resort. We base our vehicles at the departure airports to enable us to offer the lowest priced, most reliable and most punctual transfer service. Reliable service – we won’t let you down! Book your ski transfer to La Thuile with us online to ensure the fastest, most efficient and lowest cost service. If you require a service or destination which isn’t available, get in touch and we’ll do our best to help you. We operate at the lowest cost possible without compromising on service, reliability and safety. Start and end your trip to La Thuile in the best possible way.